BibleReader: This Olive Tree app allows users to read and study the Bible with your favorite Bible translations, commentaries and study tools anytime and anywhere. Version 4.08 supports bookmarks and personal notes. 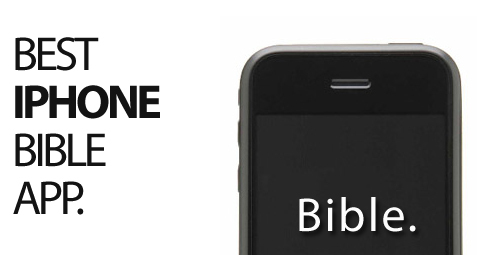 God’s Bible: This app is an entirely offline version of the King James Bible. So, you don’t need to be connected to the Internet to read the entire Bible from beginning to end. This app also contains a self-guided trax system, based upon the reader’s personal dedication level. KJV Bible Audiobook: Carry the Old and New Testament versions in the King James Bible with you on your iPhone for a donation to iTour Software (or, for free). Your donations support the Karina Association, which is working to help to improve the lives of Bulgaria’s disabled children. LDS Scriptures App: Study the Scriptures like never before, with integrated content and features that make access easy, even without an Internet connection. PocketBible for your iPhone: Laridian Electronic Publishing has issued a free King James Version of this Bible. Laridian also carries a range of other pocketbook Bibles for reasonable fees. Bible Promises: This app provides 500 Bible verses organized by topics such as perseverance, work, fear and courage – all to help you in your times of need. BibleScope: This is a Bible study application designed to maximize the reading of the Word and to allow interactions. Add bookmarks, use keyword searches to find specific words, change font size and display two Bible versions simultaneously. BibleXpress: Two versions are available – an inexpensive ‘lite’ and a more expensive regular verions. A Christian iPhone user developed and tested this software during actual sermons, Bible studies and quiet times to produce an app that anyone can use to search, save, and share scripture and lessons. BTE Ministries Weekly Bible Studies: Listen to verse-by-verse Bible studies based upon the original languages in which they were written. These are audio-only files, and the Web site provides free study guides that include literal translations, Greek/English interlinear translations and overall diagrams. Fighter Verses is a great app for iPhone / iOS and Android. It helps you to memorize Bible verses and has a ton of features.